What started out to be a small bunch of lads on a jaunt to see what all the Moto Piston fuss was about turned out to be a full-blown tour. 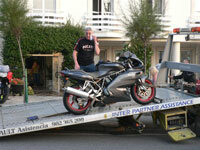 Combine a passion for Classic motorcycles with the love of travel and the result is a forgone conclusion. 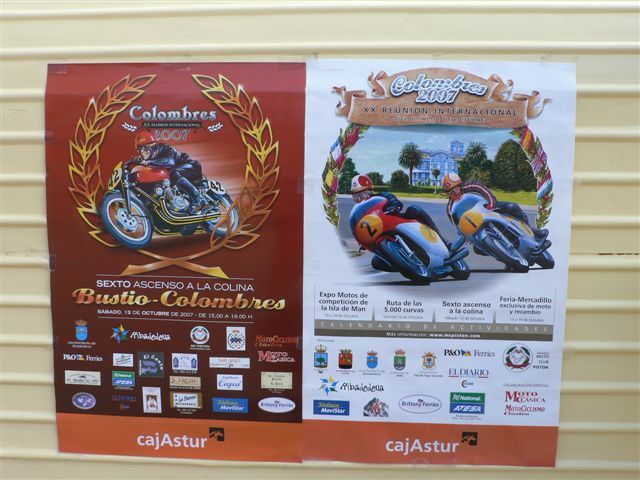 This was the formula created during the euphoric four days in Northern Spain at the countries largest gathering of Classic motorcycles. The Moto Piston rally is an International gathering of enthusiasts, but it's not just a rally, it's a combination of four different events which all take place in and around the tiny insignificant town of Colombres. During that long weekend the normally sleepy town comes alive in typically Spanish fashion with late nights, good humour, music and loads of noise from open exhausts. Now in it's 21st year this event has developed into an annual pilgrimage for UK enthusiasts. With up to 600 entries and many more thousands of spectators like us drifting through during the weekend. 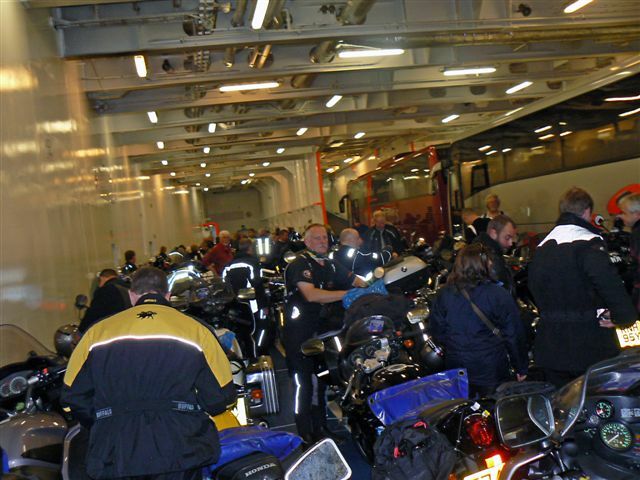 The mid day autumn sun warmed through our riding gear as we waited patiently to be called up for loading onto the Brittany Ferries Pont Aven down in Plymouth. We were surrounded by MotoPiston regulars, next to us in the queue was the pick up of Martin Holehouse and Grace Henderson making the trip for the second year, Grace earned an award on her B33 last year, but wasn't quite sure what for! Behind us a collection of immaculate Sunbeams which were trailer down from the midlands, they like us were first timers as were a couple of Tiger 110s looking better than they did when they left the factory. On board we sorted out a small hiccup over the cabin allocation and settled into our cabins to prepare for the eighteen hour crossing to Santander. 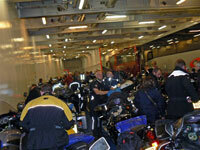 Up on decks and out of our riding gear we could get a better feel of this sumptuous £100 million ferry. Bruce Preston riding his trusty BMW R60/2 abroad for the first time ever booked our slot in the Le Flora waiter service restaurant and by 20.00hrs we were seated, enjoying the superb menu; an extensive buffet of starters, choice of main course and then a huge buffet of desserts plus cheese and a bottle of wine, French of course. Total £21.00 excellent value. There was no point in joining the mad scramble to get off the ferry, fighting our way through Santanders rush hour is no way to start the day. Once off the ferry the slow column of vehicles filed past the passport control and out onto the main highway. A panic set in as someone drew alongside me to say that Joe Newman on his aging Bonny was missing and it was his first time abroad. at that stage we hadn't even left the docks, still in the touring game we get used to that sort of panic. Joe found we made our way the fifteen miles along the coast to the hotel at Suances where we were booked in. We could have woken in heaven. 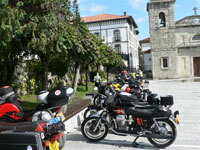 Bikes in front, bikes behind, all roads leading eventually to Colombres we were bathed in bright gorgeous sunshine. Sure this region has a name of green Spain because it rains a lot but for us the shies were clear and blue, it wasn't a dream. Our route to Suances took us along the rugged coastline. To our right the Atlantic, its foam crested breakers rolling onto the dazzling white sandy beaches. To our left a breath taking landscape swathed in a blanket of lush green pasture. All this against a backdrop of the white rock of the Picos. This is why I ride a motorcycle! Since this was a reccy tour and we had never used the hotels before I thought it best to make some introductions before the main group checked in. No worries, both hotels were very friendly and waiting our arrival. Meanwhile the group continued down the highway to the rally hub to check out the procedure for the day ahead. After the pleasantries at both hotels we moved on for more of the same wonderful riding, sweeping past spectacular scenery. Not that you could relax, bends come up quick and there was a fair splattering of slippery cow pats to catch you out on the corners. The strange thing about Colombres is that it's not signed until you take a right turn over the river bridge at Bustio and there it is the Colombres road sign. The last participants for the short High Mountain run was just departing the registration point at the Tourist Office leaving Colombres in a relative calm. Giving us time to find out the procedure for the 5000 Curve run the next day. We found lunch in a back street restaurant used by the local builders. It was a reminder that we were in proper Spain and not one of those over commercialised Costa resorts where English is spoken as the first language. However we managed to get by mainly by pointing to what the locals were eating. A selection of cold meats, fish soup, sardines with a liberal sprinkling of sea salt, a beer and crusty bread not bad for 18 euros. Drama back at the hotels Joe Newman had run out of petrol and was rescued by several of his mates travelling back to the hotel and David Woodward's Ducati refused to run on two cylinders and was towed back by the Bristol four lead by Gordon Kemp. There was mass exodus from the hotels the next morning to witness the start of the Route of 5000 Curves, the main event of the rally. 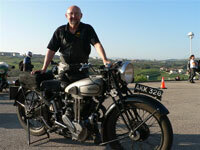 Our very own Peter Winter and Chris from Bristol had ridden their 1933 Model 18 Norton down from home and was our only official entry. Pete's Dad had bought the bike in 1941 and in the last six weeks leading up to the trip Pete had fitted four new sets of valve guides. But they weren't to be the problem Pete suffered two punctures on the 270km run, the first he repaired and was rescued by the rally sweeper van after the second. Hero of the day was Chris, how did she manage to sit on the back of this ridged rear end for so long-don't mention rear end! First timers Charlie Dolan and John Freeley from Co Cork entered on a pair of R100 BMW's. They were the first on the road at 08.32 (the crack of dawn) and clocked in first at 16.33hrs. I'm not sure if they were up for an award but they had a great ride in any case. 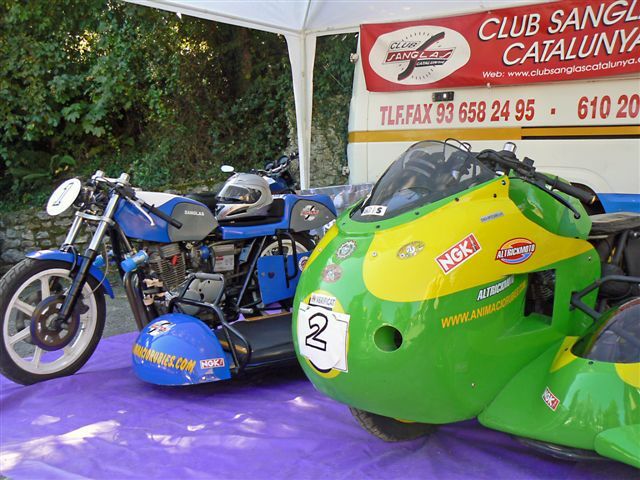 Taking part for the second year Matt Dillon on his AJS CSR 650 had dragged Andy Smith along for the first time neither was sure if they had an award either but they didn't seem to care as they had a great time just taking part. Chris and Linda Hancock riding V50 Moto Guzzi's did the course but like us found it difficulty to find anyone to speak English. Bob Collins (Veradero) Dave Brown (Ducati Multistrada) completed the route but it was far more demanding than they first thought how they do it on old bikes is amazing they agreed. won the Yugoslavian GP in Opatija and was sadly killed in the 250 TT that same year. On Sunday, again with wall to wall sunshine, it was the turn of the racers to do there bit at the hill climb. Spectators crammed into Colombres to take every advantage point no chance of lunch today the place was heaving. Parking was at a premium; on one side of the town the churchyard served Moto Piston well while on the other side of the square the traditional giant Paella was being prepared. A make shift ramp allows riders access down the steps to the ornamental gardens to park on the manicured lawn no one worries this is Spain and its fiesta time. 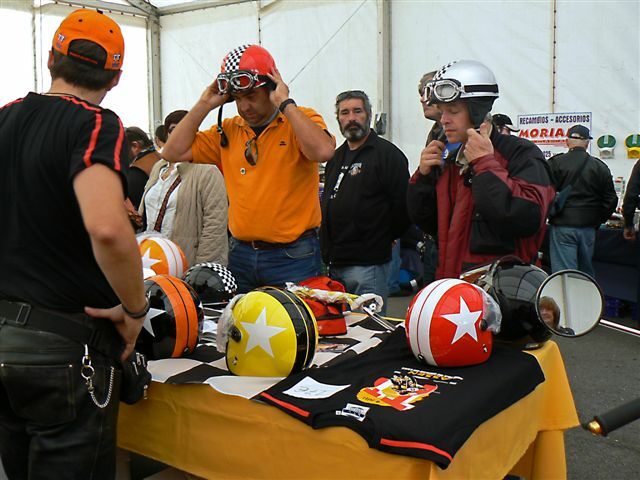 The nice thing about Moto Piston Rally is that only a few people know what's happening and yet everything works in good humour and in true Spanish style. Spectating is free and so is the wall to wall sunshine, there are no car park attendants, in fact very little officialdom, crowd control is minimum and its all very relaxed. Departure morning broke the same as it had been over the past four days, the same sun bursting through the crack in the curtained windows, the same view of the Ocean flicking white spray up onto the sandy beach, wonderful. A final stroll along the beachfront and a coffee before climbing on the bike for that 15-mile ride to Santander and our 16.00hrs departure time. More time to exchange pleasantries with friends who I'd not seen during the four rally days. On board things worked out the same, once out of our riding gear, a meal, some light entertainment and then bed, before we knew it we were summoned back to retrieve the bikes. 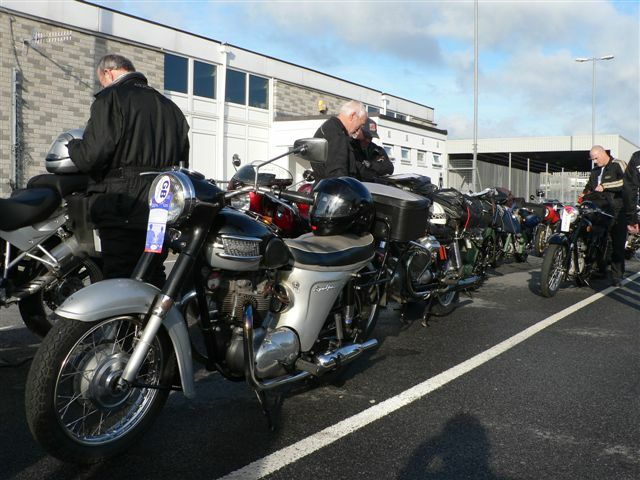 For us it had been a great October tour that started out as being a few lads going over to see what the Moto Piston fuss was about. Unfortunately we knew we were back in the UK as the bureaucracy at the docks resulted in frayed tempers and bad feeling as we all filed slowly past a single control chappy. Oh! It's nice to be back. Words and photographs by Peter Avard, cContact. peter@msltours.co.uk or www.msltours.co.uk. 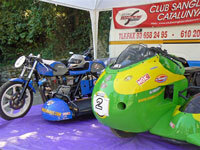 MSL Tours will be running another Moto Piston tour in 2008 as well as Bikers Classic in Belgium and the Moto Legende in France. When ships first arrived from America this mountain range was the first thing they could see as they approached land and were given the name Peaks of Europe The regions of Cantabria, Asturias and Castilla y Leon and covers 64,660bhectares share the Picos. It was declared a National Park by Alfonso X111 way back in 1918 and is therefore a protected area. The highest peak is Torre de Cerredo at 2648m. It is home for brown bear, Iberian wolf, chamois, Golden eagle and bearded vulture. There are viewpoints on the road to the Covadonga Mountains where it is possible to see the vultures feeding off the carcasses of cattle places there to feed them.